Getting ready to start my historical fiction book clubs! I love getting students outside their comfort zone. Many students don't think they like historical fiction until they get some great books in their hands! If you're thinking of starting your own book clubs, here are a few things that can help you get started on your own book club adventure! My teaching partner and I think that the "prep" is key. For this book club, we're focusing on the Civil Rights Movement. 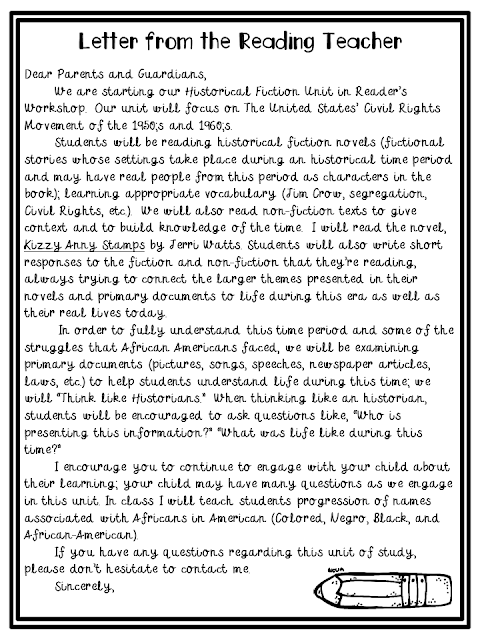 Since this time period deals with lots of tension, we send a letter home to the parents to let them know about what will be going on in our classroom and book clubs. We've also done a lot of work making this unit relevant to our students. We look for books that are current, well-written, and engaging! If you're wanting to start book clubs, here's a peek at my Historical Fiction Unit. During the first week of book club, we really try and focus on the time period. Getting students to become aware of the setting and the important events that took place during their time period. We keep track using different handouts and activities so that we can refer back to these as often as needed! How do you start a new reading unit? There are some people who like to get historical information so much and i am one of them because i want to write top essay services details about history anyway i am very happy to see most beneficent post here again and i am very thankful for it. As for me, i don't appreciate that .They have to change their opinion about whom to f*ck, cuz that's rea'lly delirious. Even www.buyessayonline.net an essay writer proved my words. The wanted poster is really disturbing. If my child came home with those details in a school report, wow, I would have some serious conversations. Plus as a homeschooling parent now, it is very inappropriate. Education is the nourishment for our soul. It edifies our psyche to such a degree in this way, to the point that light can further be utilized dissertation writing service to help other people and expand their brain and soul. It has a different productive impact over the entire country. Why Teachers Need a Reading Community, Too!